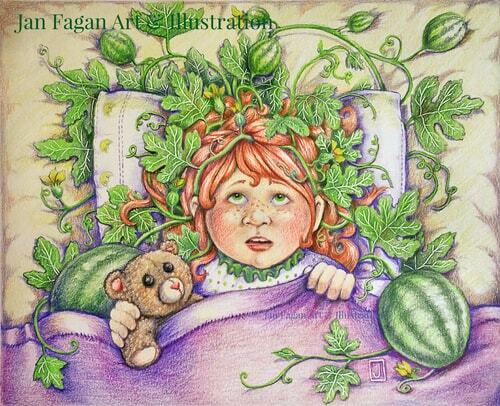 Artist Jan Fagan’s art conveys a feeling of wonder with whimsical, bright color pencil drawings that promote happiness and imagination. See more of her portfolio on her website. Many years ago, I read something so inspirational to me that it began to change how I thought on multiple levels and, by default, also changed how and what I created artistically. It is simple advice and doesn’t cost anything but it is worth its weight in gold. You ready? Here it is. At least once a day, simply try to observe something in the world around you as if you were looking at it for the very first time . . . just as you did when you were a child. That tree on the corner? Imagine how every part of it reaches both up and down all at the same time. Picture how that miracle looks in your mind. How does it know when to sleep for a long winter’s nap and wake up in all its glory in the Spring? Does it feel sadness and happiness? What if you don’t have any trees or nature near you? The options are still endless. Look at the building at the end of the city block. Imagine all the people who helped to make it happen. Who are the people that live or work in it and what are they like? Where did that stone come from? What things has that building “heard” and “seen” over the years it has been standing on that corner? Oddly enough, I don’t even remember who wrote that very wise suggestion, but I will be forever grateful to them! For me, that simple advice continues to inspire gratitude, a sense of wonder and the belief that magic may just be possible if you believe it. It is that very feeling of childlike wonderment and magical possibilities I love to express in my artwork. If you are viewing my work, I hope I inspire the same in you! Artist Jan Fagan invites you to follow her on Facebook, Instagram and Etsy. It’s great to see Jan’s work featured, she’s a lovely person and her work is inspirational, I love her gentle, whimsical style. Thank you so much for your kind words, Deb! Oh my gosh, the man tree illustration! You did it brilliantly!